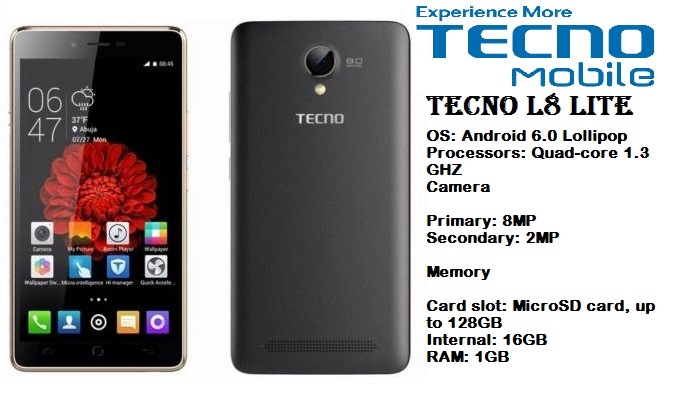 Tecno L series portfolio just got bigger with the launch of TECNO L8 Lite Android smartphone into the mobile market. Building on the success of Tecno L8 and it’s successor L8 Plus, the new Lite version is beautifully designed and packed with advanced features from its predecessors. Tecno mobile is bent on ensuring we get to see a new android phone that can compete favorably with its long-time rival, Infinix mobility every month. In September, it was Tecno Phantom 6 and Phantom 6 Plus that went live and in October, the Tecno Camon 9 and W5, an addition to the Tecno Camon C9, C8, and C7, C5 that was unveiled. Tecno L8 Lite has a large display of 5.0 inch IPS capacitive touchscreen and equipped with 16GB internal storage and a long life battery of 4000mAh Capacity to have you not worrying about running out of charge thus giving you the power to browse the Internet and all day long. The TECNO L8 lite comes with 1GB of RAM and 16GB of internal storage space. The 16GB of space can be expanded using a microSD card. Smoothly move through apps thanks to 1GB of RAM, that allow you to handle most Android tasks without any glitches. We are sure you like quick performance from your smartphone. The awesome TECNO L8 lite is powered by a Quad-core 1.3 GHZ MediaTek processor which is quite reliable for an entry level device. As for the OS, it’s same as TECNO W4, the Chinese OEM first ever Android 6.0 MarshMallow. Long are the days when you had to carry your charger everywhere you go. TECNO L8 lite has ensured that there is enough charge for you to perform all you want with a battery Capacity of 4000mAh Li-Ion that will last you long and get you browse more. Order this TECNO L8 Lite online on Jumia or Konga and have it delivered straight to your doorstep. I want to buy secondary android phone, probably Tecno L8 model. I’m working in Nigeria and want buy phone there, i’m looking for used models because of my low budget from Jiji, i’m bad in Tecno phones. Can you advice me this model with your opinion, shortly. Or i should look for another phone? Is it worth buy used android phone? Hello, Tecno L8 has 3 variants which are L8, L8 Plus and L8 lite. We did a splendid review on them all here. And you want to take a look to be able to know which of them will suite your interest.